SMOK R200 TC MOD Review – The Best Mod by SMOKtech? Disclosure: The temperature control mods which we review on this website are tested by our trained, paid staff. As part of the review, VapingDaily.com links directly to the product or brands so that you may purchase directly from the provider. We receive commissions from these providers, however, this does not affect the price you pay, and the commissions we earn help us pay for the costs of running this website. Thank you. The R200 TC Box Mod is the latest and unarguably the best offering by the Chinese manufacturer SMOKtech. The 200W output coupled with accurate temperature control mode (200-600F) that supports TCR, compact size, and the affordable price of $49.95, make the R200 one of the most wanted mods available on the market. Personally, I only prefer US made products, but SMOKtech is one of the very few Chinese brands that I can vouch for, without thinking twice. They take their products seriously, care for their customers, and most importantly, know their stuff. Let’s explore the ins and outs of the mod. The biggest selling point of R200 SMOKtech markets is its compact size. As a matter of fact, this SMOK mod is one of the most compact ones, however, there’s a little exaggeration on the manufacturer’s website. Measuring at 85.5x55x23 mm, the mod fits perfectly in your hand. But SMOK, when comparing the sizes, claims that other mods are 100mm long, which isn’t true as most modern mods are about 90mm. So, ignore their claim that their mod is 14.5mm shorter, it’s just 4.5mm shorter only. Apart from that, it definitely is one of the, if not the, smallest mods to offer a voltage of 200W. The overall design is beautiful, and the rounded edges make the design perfectly ergonomic. A special kind of paint has been used to soften the exterior finish, plus the buttons are soft and smooth. Magnetic Battery Door – Blessing or Curse? The SMOKtech R200 comes with an innovative magnetic battery door, which locks the two 18650 batteries in perfectly. It opens quickly and fastens securely, but I personally didn’t like the magnetic door for a couple of reasons. First, it requires a sturdy push and perfect alignment of the grooves and hooks on the door and the body of the mod, which makes closing the door pretty awkward. In addition, if you try to tilt or flip the mod – which I always do to keep the batteries from falling – there are good chances for the e-liquid to leak out if you’re using an RDA. This is why I like the battery door on their older model like X-Cube better. The specs of this tiny, affordable mod are simply amazing. Although it weighs half the weight of many other mods, it is a beast when it comes to performance and vapor production. It allows impressive wattage and temperature ranges of 1-200W and 200-600F respectively, and can support resistance between 0.1ohm to 3ohm (or 0.06-2ohm in temperature control mode). I normally vape at a voltage under 100, but if you like to switch a lot between different voltage levels, you’ll love how quickly the mod increments or decrements when you press and hold the + or – button. What all this means for a vaper is biggest, thickest, badest vapor plumes with minimum effort. In addition to the intelligent atomizer recognition – which adjusts settings according to the coil you use – it has several protection and warning mechanisms for your safety, especially when you vape at ridiculously low resistances of 0.06ohms or 0.1ohm. The protections include puff monitoring, 12-second cut-off protection, short circuit protection, overheating protection and low battery warning. Although it doesn’t come with low- or high-resistance protection i.e. it should stop working or at least warn you when you take resistance to levels under or over the recommended range. SMOK has managed to considerably reduce the size of the TFV4 mini tank without compromising on its capacity. It’s an open secret that TFV4 are e-juice hogs when it comes to consumption. SMOK has come up with a quirky solution to avoid this predicament. SMOK offers two shorty-sized cores, which are TFV4 0.3Ω Clapton Dual Core and TFV4 1.8 ohm Clapton Single Core. They are specially designed to avoid any e-juice waste and considerably reduce e-juice consumption. This not only lets you vape using a 4ml tank for much longer but also saves some cash in the long run. The LED display screen looks nice but is small. Maybe the manufacturer tried to minimize the overall size of the mod and ended up making too small a display. This is probably the only thing that we didn’t like about the SMOKtech R200’s design. I rather find it funny that SMOKtech has kept the time and date feature that resets as soon as you take the batteries out, which actually makes it more of a hassle than a convenience. So that’s all about the R200 TC mod, and it has some pros and cons just like any other product. But for me, what really matters when buying a mod is its features, quality, size, ease of use and affordability. The R200 gets full marks in almost every area, and I recommend it to anyone who wants to enjoy high quality, flavorful, and intense vaping, without having to spend a lot of money. 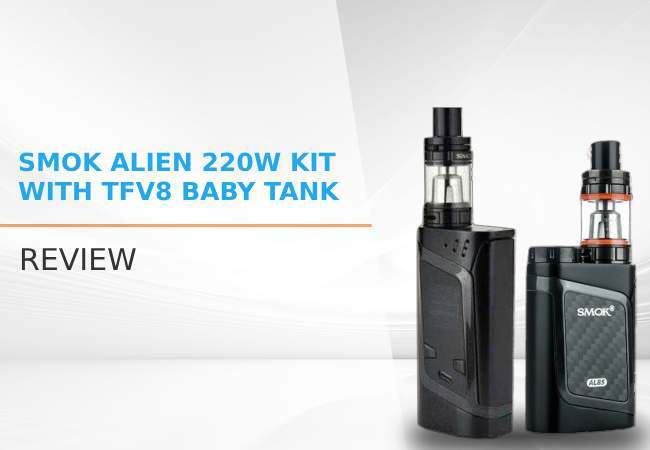 The SMOK Alien is a compact 220W mod powered by two 18650 batteries and is perfect for beginners and vaping enthusiasts alike.